What can new bonds teach us about old systems? The Chicago Teachers’ Strike represented both a galvanizing and fracturing shift in the U.S. political discourse, whose unexpected occurrence revealed both rifts and allegiances which are usually left masked. Newspapers and media sources held up as bastions of “liberal” thought were shown to be as biased and uninformed as their “conservative” counterparts. Political parties were revealed to be far less uniform in opinion on the subject of workers’ rights, and their leaders to hold far more beliefs and commitments in common than their campaign ads might let on. Communities which see themselves as aligned saw themselves splitting, and groups which rarely acknowledge one another became allies. The myth of our democracy, that the U.S. should and does always fight for the little guy, became troubled. Who the little guy was–Teachers? Students? Families? Schools?–became ambiguous, and how to fight for him–Federal funding? Charters? Unions?–became equally unclear. As a participant in some of the pickets in my neighborhood, and rallies across the city, one of the most surprising points of solidarity I saw growing was between the Chicago Teachers Union and the Chicago Police Union. While truck drivers, sanitation and postal workers, and countless others honked their horns and shouted their support while driving past the picket lines in front of local schools, I was shocked to see how often patrol cars also honked and their passengers waved. At rallies where officers were present as crowd control, they gave space to the participants, did little to provoke responses or undermine the events, and even occasionally spoke with members of the Union and showed open support for the gatherings. I don’t know that I can recall any other kind of political movement in which I have been involved–ones which, like the Teachers Strike, included labor, anarchists, pacifists and members of the occupy movement–in which police were not seen as immediate enemies, and were even thought of as distant partners in the struggle. This solidarity was exciting for me, as I come from a military family, and have relatives who have long been involved in law enforcement. The ways in which many communities I am connected to have traditionally demonized the police has always been a problem for me, as I know how officers suffer many of the same frustrations, economic oppressions, and lack of opportunity as those they have been designated to police. Even so, the unexpected bonds between unionized workers that arose during the strike, while I found encouraging, also caused me to question what it was about this movement that made it seemingly easy to call on the police as allies, and which voices might be missing within those bonds. Seeing public school teachers and police as tied through their identities as working people and unionized labor is a potentially new way of understanding their relationship. That being said, it leads to new questions about their ties as state employees, overseers for oppressed communities, and participants (willing or unwilling) in the school-to-prison pipeline. 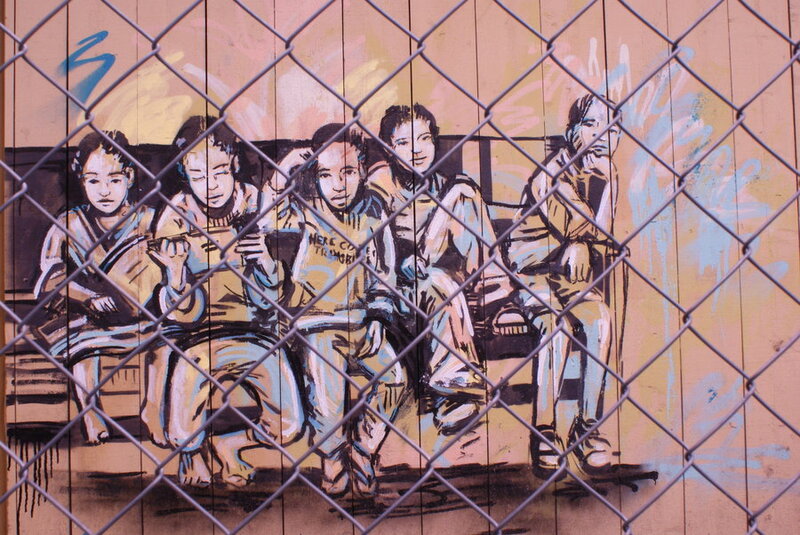 The criminalization of oppressed youth through the institution of schooling–implemented through one-strike policies, the handling of discipline with outside law enforcement agents, and high-stakes tests which encourage the suspension of underperforming students–has skyrocketed over the past two decades. As a result, schools have increasingly become the starting point from which many oppressed youth begin their journeys through the court and prison systems. This is difficult for our national culture to come to terms with, as schooling is often described as the antidote for high incarceration rates. Experts often cite the increased likelihood of those who don’t graduate high school to end up in prison, and “Fund Schools Not Prisons” is a common call. Indeed, many of the key characteristics of the school-to-prison pipeline were precisely what the demands of the Teachers’ Strike were attempting to combat. Yet what is it about the nature of public schooling that lends itself to be linked so seamlessly with the prison industrial complex? What do these institutions have in common at their foundations that make them remarkably similar in many of the mechanisms they employ, the myths they purport, and the kind of society they produce? The solidarity which arose between the CTU and Chicago Police grew from multiple points; A shared local history of class and geography; Similar grievances against the city which the Police Union has filed in recent months; The fight for unionized labor that almost all working people are currently struggling with. Yet I wonder if the ability of these two parties to recognize and support one another might indicate the deeper connections between the systems they represent; The need to protect and promote the economic interests of the powerful, which public schooling and law enforcement have both historically served; The pervasive cultural belief that teachers and police are revered guardians, and the difficult realization that they may be the opposite; The complexities of being an oppressed person who is simultaneously empowered by the state to restrain, regulate and indoctrinate other oppressed communities; The fraught relationships to their own communities that both educators and police grapple with. The shows of solidarity between public educators and police have just as much to teach about these joined realities as they do about workers’ rights and union power. Radical educator Dylan Rodriguez has said that one of the primary points he tries to stress to his undergraduate Ethnic Studies students is that the classroom as a space is not designed to accept them as they are. Its purpose is to colonize, and it is vested with the mechanisms needed to shape its subjects into the tools of their conquerers. How would public schooling change if imparting this kind of information was a pedagogical commitment in every classroom? As the links between the lives of teachers and police grow stronger, what will these links teach all of us about our relationships to systems of power, and how those relationships must change if we are to effectively oppose them?